Let us put aside UFOs and mysteries for a moment and spare a thought for INEXPLICATA's contributors in Chile: Liliana Núñez Orellana of Archivos Forteanos Latinoamericanos, Raúl Núñez of the IIEE, Rodrigo Fuenzalida and many others who have unselfishly shared their time and resources with us in making readers aware that UFOs are not exclusive to the Northern Hemisphere. This morning we heard from Liliana Núñez. She eloquently described the two minutes that she was in the grip of the 8.8 earthquake that brought destruction to her country in the early morning hours of February 27th. Her own home - a sturdy colonial-era construction - survived unscathed as newer ones toppled. Contradictions and confusion among officials, she tells us, has caused the disaster to be underreported, and elements of the Dirección Naval apparently tried to downgrade the disaster: the true size of the tsunami wave was closer to 15 meters than what was actually reported. 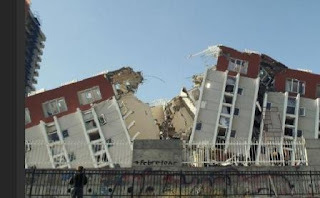 Chile now faces the nightmarish prospect of rebuilding, especially as the country enters its Fall season and the inevitably harsh winter. I urge you to help out to the best of your ability. Many thanks.